Disney California Adventure Park is part of the Disneyland Resort in Anaheim, California. The park has been open since 2001, and went through a major overhaul in 2012. It's a must-see destination for any southern California vacation. Set aside at least one day to tour the park - or more if your schedule allows. Before heading to Disney California Adventure Park, download the MouseWait app to your smartphone. According to MiniTime.com, the app will provide relatively accurate ride wait times - information that is great for planning your route as you navigate through the various lands that make up the park. Cars Land is the centerpiece of the park. Added in 2012, this attraction has three main rides - Radiator Springs, Luigi's Flying Tires and Junkyard Jamboree. Its most critically acclaimed is Radiator Springs, which recreates the Radiator Springs race from the movie Cars. Luigi's Flying Tire - Luigi's Flying tire is just that a flying tire - floating a few inches above ground you zoom through Luigi's garden and tire storage yard. Radiator Springs - Aboard a six person car, you will race the family or group next to you for the honor of winning the Radiator Springs. It won't be a smooth ride. On the way you will encounter hills, dips, bumps and high banked turns. Flo's V8 Cafe - After winning the Radiator Springs you can walk straight from your victory lap for a celebratory milkshake at this 50s style diner. Flo also has an excellent range of homemade pies. "What is most impressive is the general theming all around the area, something Disney always does so well in their parks but which is really taken to a new level in Cars Land." Go early and get in line for a FASTPASS immediately. For the Radiator Springs ride, "FASTPASS tickets are often gone for the day within 90 minutes of park opening." "When night falls in Cars Land, all I can say is 'get your camera ready'!'" Buena Vista is a recreation of a street in Los Angeles, including a replica of the Carthay Circle theater - the LA venue that premiered Snow White and the Seven Dwarfs in 1937. If you are looking for nice shops and restaurants, this is the place. Red Car Trolley - It takes eight minutes and four stops to travel from one end of Buena Street to the other on this delightful old-fashioned style trolley. If you are lucky you will catch the street entertainers at Cathay Circle. Carthay Circle Lounge - At this all day cocktail bar you can enjoy a range of cocktails beers, wines and bar snacks. "Carthay Circle is an upscale, fresh ingredient-focused dining option with the best kids menu in the parks." This charming land modeled after the world in the movie A Bug's Life includes a "Chew-Chew" Caterpillar Train, bumper cars and several other tyke-sized thrills. Watch for shows with your favorite bugs, or if you are feeling brave head to the 3-D bug movie. Heimlich's Chew Chew Train - Heimlich the caterpillar winds kids through the grass, smelling food, such as lettuce, to see if it's good enough to eat. It's Tough to be a Bug - At this 3D movie kids can see the world from the bug's point of view. What do they eat? When and where do they sleep? "Bring a swimsuit to the park. Inside Disney's California Adventure Park they have Bugs Land that has all the water that pops out of the ground." Condor Flats is a tribute to California's aeronautical achievements and in particular 1947 - the year Chuck Yeager broke the sound barrier. Soaring Over California - On this flight simulator style ride, you will fly a hang glider over the golden state that is California. Survive the intense heat of the desert, breath in the luscious smells of the redwood forest - Soaring Over California, the very latest in simulator technology, will truly banish any thoughts you have of just being in a ride. "You can't leave without riding Soarin' Over California. The flight simulator ride was my favorite ride there. It feels similar to being on a helicopter and the smell of fresh oranges when you "fly" over California orange groves is a refreshing surprise!" Discover some of Disney's movie making magic here and even draw your own character with the guidance of a real animator. This area is also where you will find Tower of Terror, by far the park's most heart-pounding ride. Twilight Zone Tower of Terror - Are you ready to enter the Twilight Zone? Could anyone be ready for an elevator to jerk back and forth, up and down and then - at random - drop you 13 stories at 55 mph? Disney's Aladdin a Musical Spectacular - Enjoy this 45 minute Broadway-style musical that follows the story, of and includes songs from, the 1992 Oscar-winning Disney version of Aladdin. Award Wieners - This place serves gourmet hotdogs, including Sicilian sausage and a range of salads and desserts. Fairfax Market - Fairfax is for those who like to eat healthy. They serves fruits, pickles and cups of vegetables. Drinks include coconut milk. With trees and rocks a plenty, Grizzly Peak "is a man-made, 110-foot (34 m) mountain in the shape of a grizzly bear, which represents California's state animal". In addition to Grizzly River run, the special park entrance for Grand Californian hotel guests is located in this area. Grizzly River Run - Going down what they call a lazy river on an 8 man raft may sound dull, but along the way you will encounter raging currents and gushing geysers. Both guarantee that you will get a good soaking. Pacific Wharf is a recreation of Cannery Row - a waterfront street near San Francisco made famous by John Steinbeck's novel of the same name. In remembrance it houses the Ghirardelli Chocolate factory and the Boudin Bakery. Bakery Tour - After Rosie O'Donnell and Colin Mochrie explain the process of making loaves of breads in an entertaining way, you will get to watch experts make the world famous San Francisco sourdough bread - a staple of Boudin Bakery, the oldest company in San Francisco. Ghirardelli Soda Fountain and Chocolate Shop - This legendary California store sells ice cream sundaes with an endless number of toppings to splash on top. Wine Country Trattoria - Enjoy a wonderful meal at this excellent Italian restaurant that specializes in pasta and salads and - of course - wine. Overall it has 25 wines to choose from. Outside of Santa Cruz and Santa Monica, Paradise Pier is the closest thing you will find to an authentic California boardwalk. 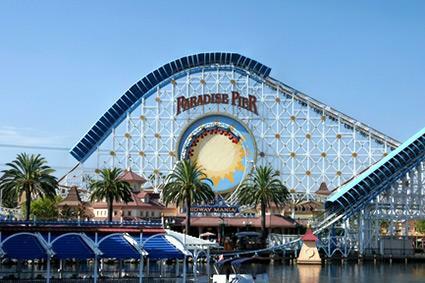 Its 160-foot Mickey's Fun Wheel and 6,072 foot long, 120 foot high California Screamin' roller coaster, both towering over a huge body of water, make for an impressive skyline. California Screamin' - A California Adventure staple, it is one of the few rides that remains relatively untouched since the park's opening in 2001. It is a 120 foot high, one mile long steel roller coaster that can hit speeds of up to 55 mph. The Little Mermaid - Moving slowly through the sea's underworld in what is called a clam mobile kids will meet, among other character from the hit film Little Mermaid, Prince Eric, Sebastian and Ariel herself, and watch them perform hit songs from the film Little Mermaid. World of Color - This spectacular water fountain show is similar to the renowned show at Bellagio in Las Vegas, but even larger. Enjoy nearly 30 minutes of special effects along with a musical score featuring beloved Disney songs and characters. "With 'World of Color,' Disney and its hungry-for-a-hit theme park have got themselves a [James] Cameron-like moment of glow-in-the-dark spectacle - and, just maybe, a new brand of night magic that can coax today's youngsters to look up, up and away from their cell phones." "You can get a needed FastPASS reservation for World of Color first thing in the morning, or you can skip that step and still get a reserved seat for World of Color by booking a dinner package." The following are general tips for visiting California Adventure Theme Park from people who have visited the park since the opening of Cars Land in 2012. "To avoid the fees at the ATMs, you can purchase Disney Dollars instead (they will show on your credit card bill as a purchase and not a cash advance." "If possible, park in the Woody lot. The Jessie and Buzz lots are further away from the entrance to Disneyland, Downtown Disney and Cali Adventure. So the shuttle ride to and from the Disney trifecta will be shortest if you park in the Woody lot." "Disney California wasn't really worth visiting until they gave the whole park a makeover. It now feels much more "California" and much more Disney versus what it was before." Now armed with these tips and hints only stormy weather (check the weather before you go!) can stop you having a great time at this increasingly impressive park. Who knows, give it a three or four years and it could be the best theme park in the world. It has certainly proven it has the resources to get there.